A true measure of economic vitality is measured by wealth. We can look at incomes or other measures of productivity but real wealth is measured by net worth. Who controls wealth in the U.S.? According to a study from the Joint Center for Housing Studies the top 25% of U.S. households control 87% of all wealth in the country. That number comes out to a nice hefty sum of $54.2 trillion. If we look even closer at income distribution, we will find that the top 1 percent in our country control 42 percent of all financial wealth. By all measures being able to acquire a piece of financial wealth was the hallmark of the middle class of previous years. Today we have a society largely in debt to credit cards, auto loans, student loans, and immense mortgage debt. Net worth is measured by looking at assets minus liabilities and many Americans are lucky to break even while many have a negative net worth. In fact, many of these banks simply made money by hoarding money and actually lending it back to the U.S. government (who actually bailed them out to begin with). These weren’t successful companies that produced a solid product. These are the companies that failed but had politically bought out the right connections. The U.S. Treasury and the Federal Reserve are designed to protect the top bracket of our society while allowing the systematic dismantling of the middle class. They call the current process the “free market” but this doesn’t apply to the biggest corporations in our country. In fact, many have leveraged the current recession to squeeze out every ounce of productivity from their current workers. Buying out politicians through lobbyist is merely another line item expense on their balance sheet. “(China Daily) He said the income difference measured by certain indexes such as Gini coefficient might not reflect the real situation in China as it fails to take the local social welfare system and wealth disparity into account. “Things could be even worse if we consider all these aspects,” warned Li, citing although the index of the United States is also above 0.4, but expenditure on social security and welfare accounts for about 50 percent of its total fiscal outlay, 40 percentage points higher than in China. When you break it down like this, you can see why most Americans have felt very little impact from the historical amounts of bailouts that have gone into the system. The quarterly profits from the banks should tell you exactly what is occurring. As local small businesses struggle with the recession and have difficult times accessing loans, big corporations and banks have no problem getting funding because they already have control of most of the wealth in our country. 90 percent of all households earn 70 percent or more of their income from wages (presumably from actual work). But take a close look at the capital gains line. 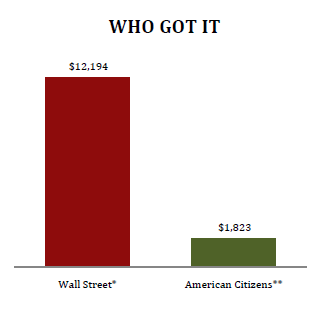 The vast majority of Americans get 2 percent or less of all their income from capital gains. You have to get into the top 10 percent to see any sizeable amount. And even here, you would have to break into the top 1 percent to see real sizeable gains. So this idea that the stock market reflects the health of Main Street is bogus but is a form of consumer manipulation to get more people into the rigged stock market to continue to fund the corporatocracy hunger for more capital. Now that they have control of the government, they don’t care if average Americans jump into the game. It is easier to rob it directly from bought off politicians. Even as the recession has put our underemployment rate to 17 percent and has wiped out trillions of dollars in aggregate wealth, those at the top have actually become richer relative to most Americans. You see many of these banking PR representatives with their sob stories of how much money they have lost. It is nonsense because money is worth what you can buy with it. So now, that millionaire banker won’t have to spend $20 million for that private home, he can have it for $10 million. So his salary might be off by 10 or 15 percent but his buying power just increased because most people are struggling with wealth destruction if they work in the real economy. Or these large banks can hire cheap labor since so many people are unemployed and use bailout funds to turbo-charge their bonuses. This is how America is looted by the corporatocracy. In fact, it is a casebook psychopath. Yet under the law it is treated as a person and presumably, is acting under a moral obligation to society. If you went out and robbed a bank, you will go to prison. If a corporate bank robs the U.S. Treasury, it gets even more money with the threat of “we are too big to fail.” So it should be no shock that banks are raiding the public trust and buying out politicians even though the current Wall Street structure is damaging to the health of America. These people are so delusional preaching their “all things are great” mantra and forget to see that the current structure has led us to the biggest economic calamity since the Great Depression. Clearly something has failed here. If we keep allowing the current structure to play out the middle class will slowly fade away and be replaced by an even stronger corporatocracy. The growing income disparity should give you a quick hint where things are heading. The fact that you can’t pay for college without going into massive debt through the banks is another hint of where we are going. This falls into the new paradigm of corporate rule because they would love nothing more than a giant population of mindless drones who simply go out and purchase their goods without questioning the system.